Klingon gagh, no doubt, is the iconic food of the modern Star Trek canon. Whether it’s on The Next Generation or Deep Space Nine, whenever a group of Klingon warriors congregate together to share a meal and sing a song, there are two things of which you can always be assured: first, that there will be loud calls, in mixed tones of anger and levity, for another barrel of blood wine; and second, that there will be the relished consumption of gagh. According to Memory Alpha the great wiki repository of all things Star Trek canon, gagh is a Klingon delicacy made from serpent worms. Although most Klingons preferred it live, it could also be served stewed or cold. 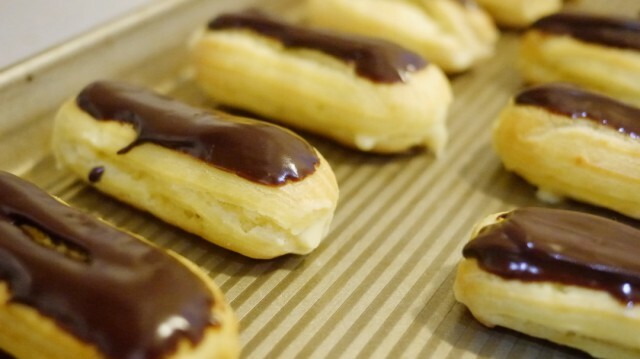 These eclairs were pastries of necessity, people. With almost four dozen eggs haunting my fridge, I really had no choice but to act rashly. 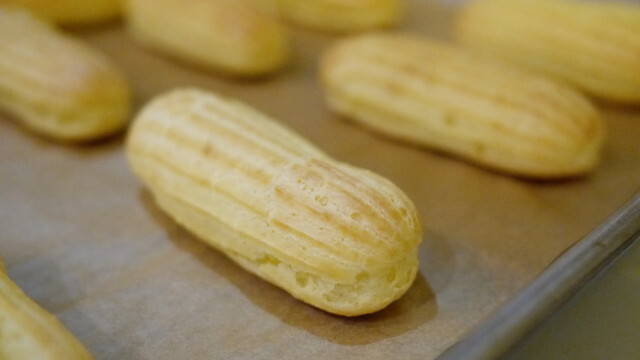 But the thing with making eclairs for no particular occasion is that they can only be done in batches of two dozen. And with only three or four people to devour them — that’s a high per capita rate of pastry cream. I cannot — alas — give you a recipe. It isn’t mine to give. But if you’re interested, I would highly recommend investing in a copy of Pastry: Savory & Sweet by Michel Roux . It is short, cheap, and has lots of pictures. But despite those things, I have not seen a better book for making elegant pastries at home. Just when I thought I was out, the mead keeps pulling me back in. It was less than a month ago, now, that I bottled last year’s strawberry melomel. With Sarah’s invaluable help, there was a flurry of sanitizing and syphoning, filling, corking, cleaning, and trundling boxes of bottles down into the basement. The strawberry mead came out just right: pale pink, with a definite and delicious fruit flavor, and a hint of oxidation that adds toffee complexity at the back end of every sip. It will need to age for a year or two. It’s still a little hot, alcoholically speaking. But I’m pleased. No doubt — one of the better meads I’ve made. This should come as a surprise to no one who has ever been there, but I’m going to say it anyway: hands down, New Orleans in my favorite food town in the United States. It exists at the cultural convergence of French, Italian, and down home Southern foodways. It draws on the best of Creole, Cajun, and Caribbean cuisine. In the past ten years, it has developed a strong link to Southeast Asia. And all of that while sitting on top of some of the best seafood on the continent. It’s hard not to love New Orleans cooking, and when Sarah and I were down there last month — roadtripping and visiting my (too often neglected) family — we both fell in love with the food all over again. The fine dining, of course, is great. But we mostly went to in the other direction: po’ boy shops for fried oyster sandwiches (dressed); Mandina’s for trout almandines, sherried turtle soup, and crab parts buried in garlic and butter; into the French Quarter for raw oysters; and then out into (as far as I could figure) the middle of nowhere for some of the best phở I’ve ever eaten. 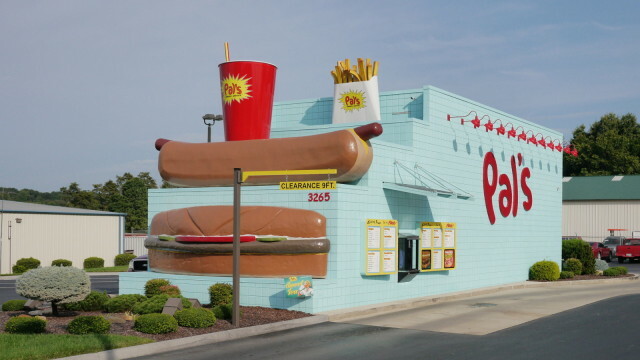 I had no idea that such a thing as a Pal’s Sudden Service existed, but apparently, they sell hamburgers, chili dogs, and sweet tea all over Tennessee. I did not — alas — get a chance to eat at one of their establishments. But the delightfully campy exterior of this specimen in Greeneville tickled my sense of Americana. And when next I’m passing through the neighborhood, if I think I can stomach a dose of fast food, I might just stop.